The Detroit Red Wings have signed Justin Abdelkader to a seven year deal worth $29.75 million, which translates to an annual value of $4.25 million. The 28-year-old from Muskegon, Michigan, is in the final year of his current four year contract. That deal is worth $7.2 million, so this is obviously a pretty nice raise for Abdelkader, who was selected by Detroit 42nd overall in the 2005 NHL Entry Draft. In 15 games this season, he has four goals and three assists. One of those goals came on the power play but two are game-winners. Abdelkader’s best season with the Red Wings so far was came in 2014-2015 when he piled up 44 points in 71 games, including 23 goals. Eight of those goals were on the power play. 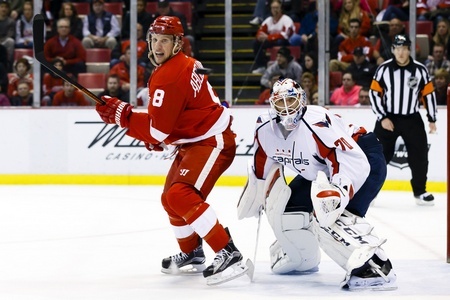 Of course, a big benefit for Abdelkader has been the way he’s meshed with Henrik Zetterberg. He’s spent as much as 80 percent of his five-on-five ice time with Detroit’s captain, plus he received a major boost in power play time and has seen that pay out dividends. In a sense, the Red Wings have been looking at the 6’2, 218-pounder as the second coming of Tomas Holmstrom if only for his ability to grind and get in front of the net while Zetterberg and Pavel Datsyuk do their thing. It may not be a perfect comparison, but Abdelkader obviously has paid off in terms of his play with others and the deal isn’t a bad one to secure one of the league’s rare breeds. The Detroit Red Wings will now turn their focus to signing the likes of goalie Petr Mrazek and defenceman Danny DeKeyser, both of whom find themselves in the last year of their current deals. Darren Helm and Drew Miller are also on the to-do list.